I’m so happy to share with you the 2015 calendar! It’s 12 months of some of my favorite hymns! I always seem to run really behind on starting on my calendar. I just sent it to the printer a week ago and got a proof today from my printer. I’m so happy with the color and quality. You can preorder the calendar on etsy for $18 with free U.S. shipping. The calendars will ship by November 1st. I’m also running a special – buy two calendars, get one teeeny print free! I think the hardest thing on this project was deciding on which hymns to pick. 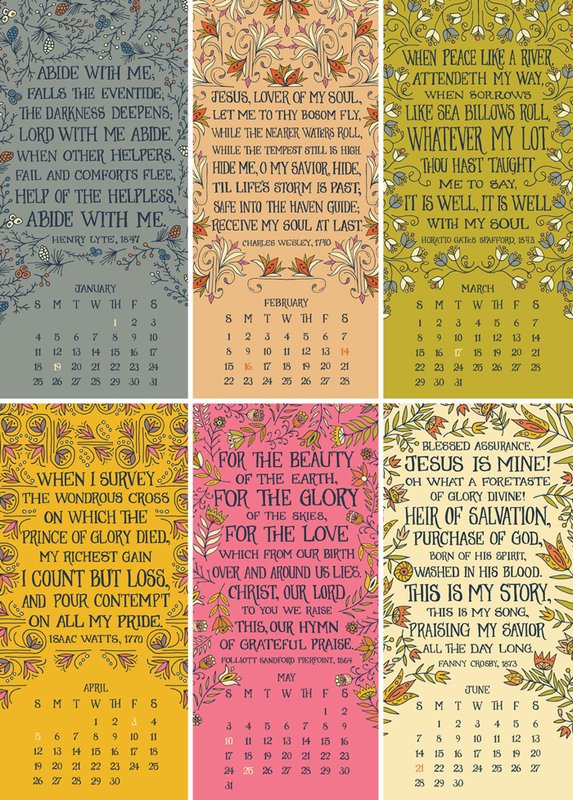 SO here are the hymns that I picked for the calendar. Here are the backs of the each month – filled with bright colorful patterns that are perfect for you to reuse once 2015 is over. I’ve been overwhelmed with the response to preorder. I thought I might get 10 preorders, and I’m still shocked at the number of orders that have been placed. I had to bump up my order from my printer! 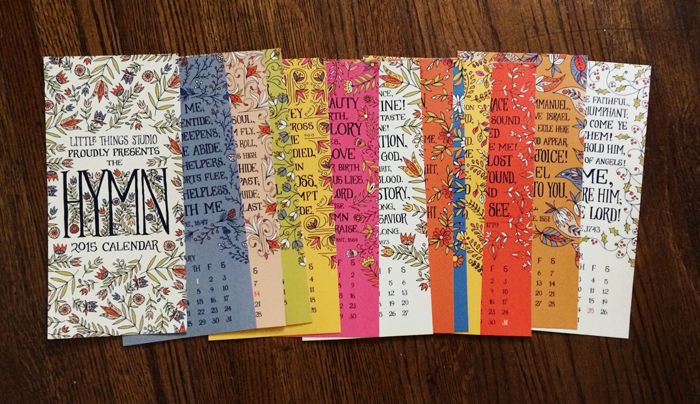 And I’m thinking about doing another hymn calendar for 2016, because there are a still a lot of hymns that I need to draw. I will also be turning a lot of these hymns into art prints before Christmas so be sure to be on the lookout for that! BUT I still need YOUR help getting the word out! If you are a fan of hymns, would you share with your friends and family? Or let me know a Christian blog that might be interested in the calendar! I would normally submit my calendar to a few design blogs, but I honestly don’t know if I’ll get the press because it’s Christian content. thank you so very much, Brenda!!! These are beautiful! How do I order? I love this so much!! I can think of lots of folks (including myself) who would want this under the tree! You should try Darling Magazine. I’m pretty sure they would be interested. I’ll definitely be spreading the word. Will your shop be available soon on Etsy to order a calendar?